New York’s Mayor Michael Bloomberg is not a fan of Banksy. For 20 consecutive days the graffiti artist from my home city of Bristol has revealed a new piece of artwork in the Big Apple. But Mayor Bloomberg is impressed, saying that graffiti “does ruin’s people’s property” and was “a sign of decay and lost control”. While in New York they have pledged to remove the artist’s works, elsewhere in the world he has big fans in local authorities, not least in Bristol. The City Council has got behind Banksy and in 2009 allowed him to take over the main museum for a 12 week-long show which attracted more than 300,000 people (around 4,000 people per day). Crowds waited for hours to get into the critically-claimed exhibition. 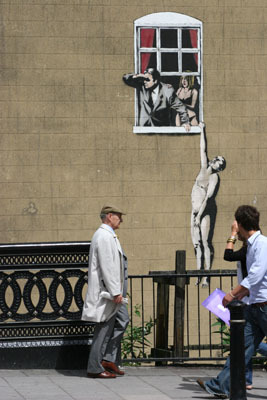 And it’s believed the “Banksy Effect” £10 million into the city’s economy and many businesses saw their turnover double. The exhibition boosted the coffers of not only shops, restaurants and hotels, but also other tourist attractions such as the SS Great Britain and Bristol, which saw visitor numbers increase during the show. Knowing how important is for Bristol, council chiefs have even paid for some of his artworks to be repaired when they have been defaced. Banksy’s work can be seen all around the world, including Palestine from where I blogged from earlier in the year. I met a businessman, who knows the identity of the publicity shy elusive artist (speculation about exactly who Banksy is has been ongoing for years), who has opened a Banksy theme coffee and shop. The Israeli authorities aren’t a fan of his because of his pro-Palestine stance. He has therefore become caught up in one of the Middle East’s longest running conflicts. But aside from the politics, Banky has become big business. His works now sell for hundreds of thousands of pounds. Rather than trying to “Get Banksy” (the front-page headline that the New York Times recently ran, following reports police want to arrest him), the city should follow the lead of Bristol and help him drive tourism. Art doesn’t need to be in stuffy galleries, it can be just as powerful on the streets.